Readers of this blog will be aware, that much of my shooting revolves around the shopping habits of my wife, she likes to shop and I prefer to go shooting. A glorious afternoon had followed a grey morning and with a family wedding coming up, my wife needed to checkout some colour options in a town close to one of my small farms. Dropping her off, I had about 90 minutes, before providing her taxi home and the Magtech was the chosen tool for the job, as I would be doing a circuit of the farm, no time for a stake out today with the HMR. Coming through the gate I kept a low profile, knowing that rabbits could be anywhere in the field to my left, taking cover behind some old straw bales, while scanning the area. Sighting on a pair feeding close to the tree line, a blurred shape appeared in my scope sight. A rabbit had run out only yards away from behind the bales and I reduced the magnification down to the minimum, the still blurred image an unmissable head shot, when I fired. Missed it! In my haste, I’d forgotten to hold over on the shot, with the rifle zeroed to 50 yards, at 5 yards I needed to allow for the height of the scope from the barrel, about two inches, the bullet harmlessly nicking the fur of the neck. Panic reined, the rabbit jumped and bolted, running in a curve toward the long grass. One of the far rabbits remained long enough for me to adjust the scope back to 50 yards and sight the rifle, before ducking back into the undergrowth. Educated bunnies. These have survived this long for a reason. Returning to the gate, I surveyed the path ahead, an area that had a large warren among the brambles this year, but twenty rabbits later, it is almost clear, although, as I stood soaking up the autumn sunshine, I watched a brazen pair of rabbits trot down the slope and through the fence to began feeding on the grass in front of the far gate. Resting the Magtech on my gate, I sighted for a side on chest shot and heard the thump of the heavy 40 grain bullet strike home, tumbling the rabbit, while the other one looked up, then bobbed out of view. Keeping close to the brambles for cover on my right, I moved down to pick up the first, then saw the second sitting upright in a small paddock. It was facing away from me behind a wire fence only 25 yards away, an easy shot to hand, but missed, the bullet ricocheting off the wire with a whine. The rabbit still sat and I quickly took another shot, puffing up the dirt behind it. Missed again, startling the rabbit, which turned and ran toward me, knocking it down with the third. It was all over in seconds, rapid fire the advantage of a semi-auto. Fortunately the owners were not home and with a good backstop, there were no safety worries from stray bullets. Picking these two up, I made my way through the gate, back down the lane to the van, flushing out another, which ran diagonally across in front of me, out of sight round a corner toward the farmhouse. Dropping the rabbits I followed, peering through the bushes at the corner, seeing it by a white metal gate, but not with a clear shot.Taking off my gun bag, I got down on my stomach, pushing the bag round the corner, resting the rifle. The rabbit was still there, just 20 yards away and shuffled my body round for the shot, hitting it behind the ear at an angle, flipping it in the air with a reflex jump. 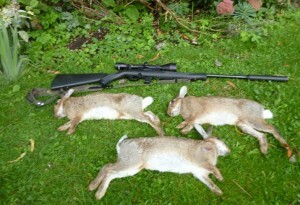 These days three rabbits is a good return for a visit to this small farm, the lightweight Magtech, only weighing 5 lb with scope, sound moderator and 10 shot magazine, is effortless to carry, coming up to the eye instantly for a clear shot out to sixty yards, although this afternoon, all rabbits were taken within air rifle range. With taxi duties waiting, I reluctantly had to turn a blind eye to the field behind the farmhouse, where a few more fat bunnies were sunning themselves, resolving to start my circuit from there next time. The onset of a heavy head cold gave me two cure options this week, take loads of medication and sit at home in front of the TV watching repeats on Dave, or get out and go fishing to blow the cobwebs from my brain. Choosing option two, I set about getting organised for the following morning. The remnants of left over bait, already used twice, were taken from my bait fridge and examined. Red and white maggots had been given fresh maize meal a few days before and at least half had turned to casters. Running these through the maggot riddle produced a quarter of a pint of sinkers and put the reds back in the fridge as hookers, while leaving the whites out to turn, picking off more fresh fat casters, before retreating to bed with a hot toddy. The next day I awoke feeling terrible and could not believe that I was making myself go fishing, wandering around bumping into things, while my wife made me a packed lunch, happy to have my germs out of the house. The last of the casters were picked off and refrozen hemp seed taken from the freezer, before loading up the van, which took extra effort, due to feeling weak, destination a free stretch of the river Blackwater ten miles away. 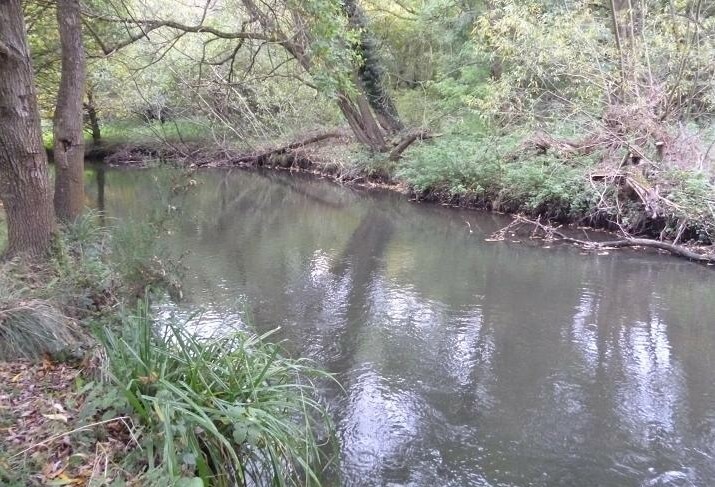 With so much good fishing on my doorstep, due to the extra distance, I tend to ignore the Blackwater, with it’s twists and turns, creating fast runs, that give way to deeper pools, offering a challenge to the stick float fisherman. I was tempted to drop my tackle box nearer to the road, but slogged on upstream, dragging my fishing trolley along the narrow path, until I reached a swim new to me, where fast water rushed round the outside of a bend into a short straight, before sweeping out of sight again. Positioning my box at the tail of the run, where there was just enough room overhead to fish a float rod, I was ready for a cup of tea, taking my time to lay out my nets and bait to hand, feeding a couple of handfuls of hemp into the channel in front of me, then spraying red maggots over the the top, to get the fish interested. Setting up my 12 ft Hardy match rod rod with a 4 No 4 bodied stick float to 5 lb main line and a size 16 to 3 lb hook link, I was ready for anything, this water noted for some big chub and roach. Plumbing the channel, two feet of fast water dropped to three feet ten yards down, then came up to 30 inches, an ideal holding area. Another spray of maggots and I cast in with the float set to only two feet, to run through, but it tilted over and sank seconds after hitting the surface. A silver flash and I was playing a small chub, which ran straight over toward a dead tree along the far bank. The initial run halted, this was soon in the net, followed by a few more of similar size, until the bites stopped. 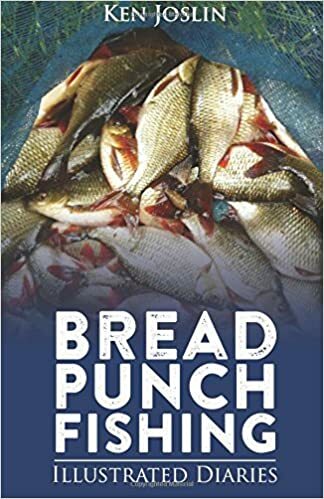 I was now feeding several casters with hemp every other cast, while trotting red maggots on the hook, setting the depth to trip the bottom, running and holding back the float as it searched the channel, small perch and big gudgeon stopping the float every time. It was still not midday, but these pics show how dull and overcast it was, the flash of my camera on automatic, the wind was also picking up, every gust raining down ripe acorns from the oak above my head. The good news was, that apart from a sore throat, my cold symptoms had been blown away with the breeze. Suddenly the maggots were being smashed on the merest flicker of the float, dace were now in the swim, chasing the bait as it fell through. Pulling the shot down into a bulk group, with a No 6 on the hook link was the answer, slowing the float to half pace resulting in a firm dig, that bounced the rod top. The next trot giving a firm take and a dace spiraling up from the bottom. With a caster now on the hook, I dropped the float in at my feet and held back hard, the float burying deep with a good fish, that ran for the far side, thinking that it was a chub, but that thudding fight and a deep flash of silver said big roach and I took my time bringing it over the net. About 12 ounces, this was my best roach for a while and just what I’d hoped for, the hook falling out in the net. Another caster on the hook and the float sank at the same spot and a slightly smaller roach followed. Now only feeding caster it was pot luck what took, the bites unmissable, if it wasn’t a roach, or dace under the rod top, a perch, or gudgeon would oblige, both these fighting deep, punching well above their weight; further down chub were mopping up the stragglers, almost hooking themselves, as they turned away. I was now in full flow, cold? What cold? I adjusted the keepnet , pushing it lower to allow more room for the fish and kept feeding, just a few casters at a time to keep them interested, I didn’t want to feed them off. Another nice roach, this time on a maggot. Next cast I saw another roach flash, then pull off the hook, the first I’d lost. More feed and I dropped in again, the float sank and another good roach was on. A green flash and a pike had grabbed the roach. The rod bent over with the weight, then the roach was free, skating across the surface in panic, pursued by the pike. I dragged the fish away from it’s open jaws and swung the half pound roach in, the landing net not an option. This once pristine roach, was savaged, but still alive and I walked upstream twenty yards to release it, watching the casualty swim away into the depths, as though nothing had happened. I have caught recovered, pike damaged fish before and hope that this one will survive. I was now determined to catch the culprit, setting up a heavy feeder rod, the reel filled with 15 lb line and my largest hook, a size 12 forged barbless tied direct. Two AA shot were pinched on a foot from the hook and I was in business, next catch a live bait. Shallowing up on the float rod, I cast over to the shelf along the far side and a small chub obliged immediately. Transferring the chub to the big size 12, I swung the lip hooked bait fish over to where the pike had struck, watching the line sink, then move steadily upstream. I lifted the rod gently, seeing the pike had already taken the chub. I waited a minute for the pike to turn the bait, then struck hard. He was on, all hell breaking loose in the confines of the tiny river, straining hard every time it dived for the roots, eventually wearing the fish down, succeeding on the third attempt to get the 30 inch pike into my 18 inch landing net. The hook was set firmly in the bottom jaw, but the size 12 barbless came free with a push from a disgorger and after weighing in at over 7 lb, the pike was released 50 yards down stream, lying dogo in the stream. Returning to my swim, I was not hopeful, that the catching spree would continue, considering the amount of disturbance landing the pike. The next twenty minutes yielded only one chub, taken well downstream, even the perch and gudgeon were gone. I fished on until 2 pm, then packed up, loading my trolley for the long trudge back. Without the intrusion of the pike, the roach would have kept coming I’m sure, although I have yet to have a session on this river, when one did not appear, the last time perch were being attacked. On my walk back to the road, I met an East European fisherman, spinning for pike with a 6 inch spoon. His English was not good, but when I showed him the picture on my camera of the pike, he smiled and nodded, making a knife and fork motion with his hands. I shook my head and signed putting the pike back. “No, no eat” he replied. Maybe there won’t be so many pike to bother me next time? 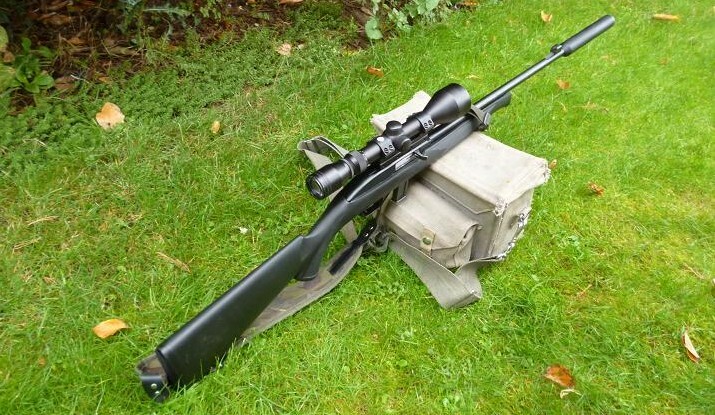 CZ 452 .17 HMR accuracy scores on new permission. 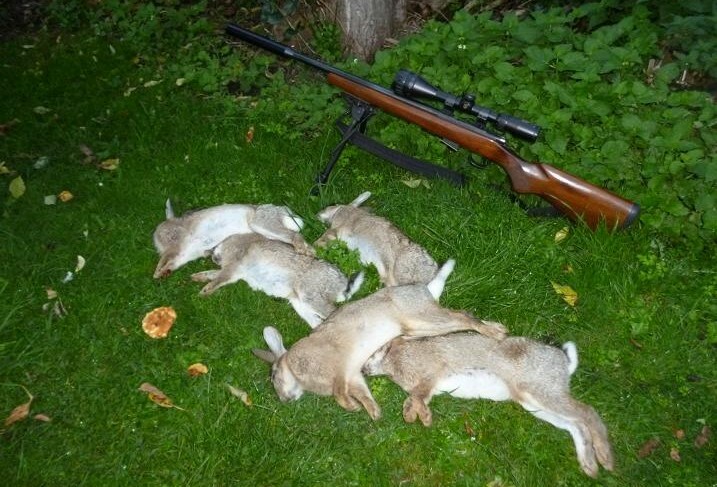 Having been granted permission to shoot over a new 20 acre area of grassland and mixed scrub, I’d been back a for few visits, picking off a couple of rabbits each time, before moving on to other farms in the area on a whistle stop tour of quick and easy kills. It was time to give the land a bit of attention, while touching base with the owner. The grass had been cut in August, but wet, warm conditions had soon increased it’s length, ruling out any prone sniping, but a solid fence post gave a firm support for the CZ 452 Varmint. 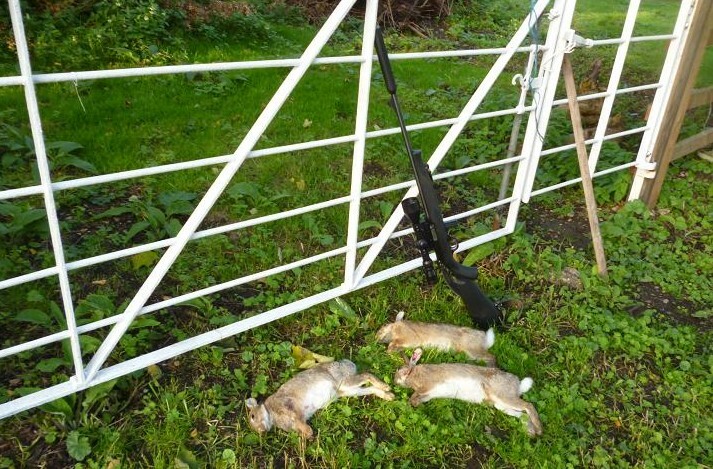 Small groups of rabbits were visible close to the hedge line extending to within sight 300 yards away, but there were three within 60 yards, taking the nearest two in the time it took to shift the bolt, while the third made it back to the brambles and safety without stopping for the expected, usually fatal pause, before disappearing. Side stepping a clump of trees, I had a clear view of the top of the field, where an unsuspecting rabbit was munching in the long grass, it’s twitching ears visible about thirty yards away. Leaning against the trunk of a tree, I reduced the scope magnification to the minimum x4 and raised the rifle, sucking in air between pursed lips to give a long squeak, the ears pricking up, before the head lifted in time for a steadied shot. The rabbit dropped from sight. In cover behind the trees, I patrolled the two views over the following half hour, shots at 80 and 100 yards resulting in two more kills from the middle section. With no more incursions, I climbed the gate to pick up the rabbits, still looking for the one from the long grass, when the owner came out of his house for a chat, his dog locating the missing bunny, it being twenty yards away from where I thought that I’d shot it. 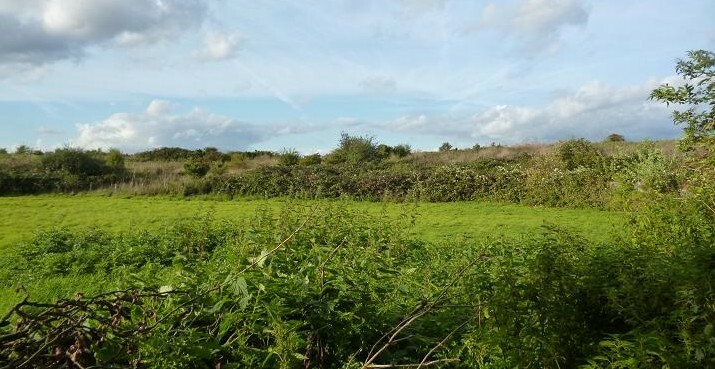 The owner took me on a tour, down to the far end among the trees, which shows evidence of being an old dumping ground, burrows pock marking the mounds, all in view of an ideal sniping point, raised ground surrounded by bushes. While I have been climbing the gate for access, he now gave me permission to enter the field through his garden, where mounted on a pedestal is a 12 inch search light, a relic of his days in the navy, which he then proceeded to demonstrate it’s use, this also being available for me, when the nights draw in. 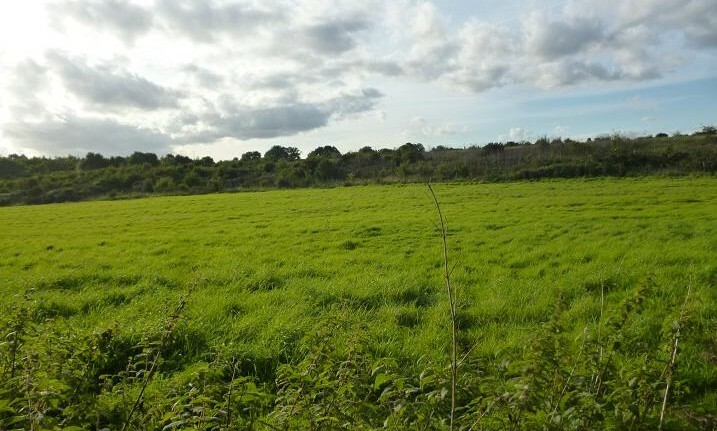 I have obviously made a good impression on the landowner and must continue to do so with regular visits. With five big bucks in the bag, the light was now fading, following my impromtu tour of the site and on parting, was offered one of his private parking places for my van next time. All good news. 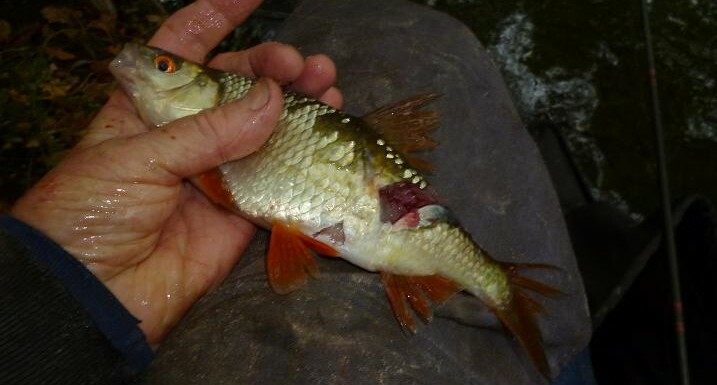 Grayling see red in urban river. 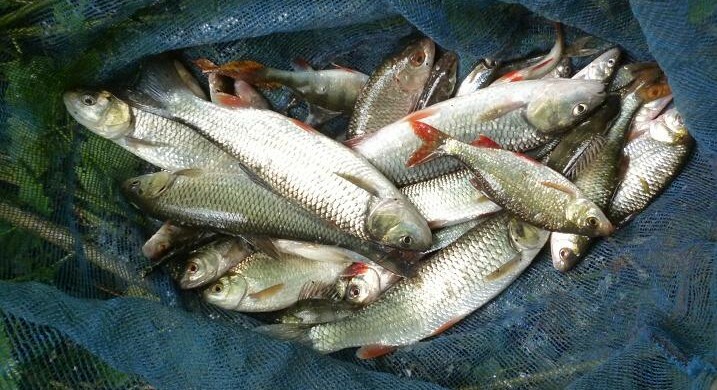 A cold morning clearing the garden ready for winter, was giving way to warm autumn sunshine and I decided to investigate a friend’s report of grayling being caught from a river running through the factories and houses of a large town 30 miles away. Lunch over, I collected up my flyfishing gear and headed off into the sun, parking up in a shady lay-by spotted on Google. 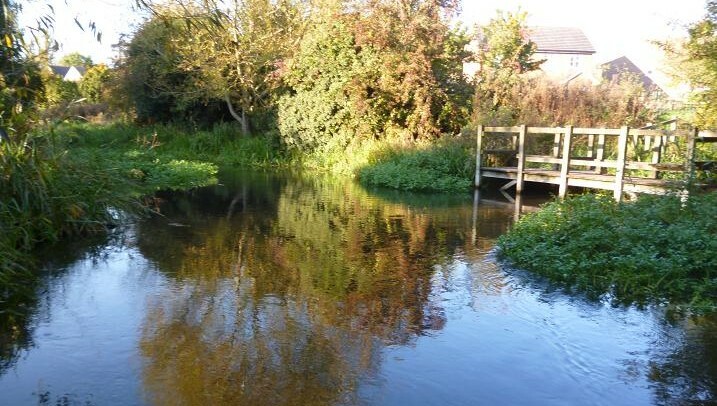 Pulling on my waders, I realised that in my haste, I’d left my landing net behind, which would only be a problem of course, when and if I caught anything. Dodging between cars on the main road, I crossed to enter the footpath skirting the river, which seemed as busy as the road, passing office workers, pram pushers and dog walkers, while stepping aside for cyclists. In contrast the river, only yards away, was a place of tranquility, a kingfisher darting upstream, as I stood looking at the crystal clear water. Not local to the area, I would have passed over the road bridge without a second look, unaware that much work had been done by the developers of the land to create a perfect environment for fish, groins having been placed at strategic points to speed up the flow, while trees have been left in place to provide cover. There were plenty of riffles, slacks and eddies, it looking very fishy, but the proof of the pudding, would be in the eating, as they say. My 7 ft rod was still set up in the van from the last outing, complete with a Flashback Gold Head Hares Ear nymph, which I thought would do for a start and entered the river, wading up toward a groin, where I cast up along the crease into the faster water. It seemed too shallow to hold fish and was not suprised, when the leader sank ahead of me and I lifted into the bottom. The line gave a slow bounce and I was into my first fish, which was obviously a grayling, the slow rolling fight, exploding into a powerful run upstream. Having caught many grayling in the past, I was aware of how easy it is to pull out of the soft mouth, giving line, but staying in contact, allowing the fish to make all the running, watching it twist and turn in the current. A good size, the grayling was at least a pound and with no net, needed to plan ahead to land it, wading across to a gravel beach, as the fish ran downstream past me, using it’s sail like dorsal fin to collect the full force of the current. More slow rolls and it came back to me on it’s side, scooping the still strong grayling out with my hand behind the pectoral fins. What a beauty, the scales shining with iridescent colours in the autumn light, a quick measurement with my tape rule reading 14 inches from nose to fork of the tail. 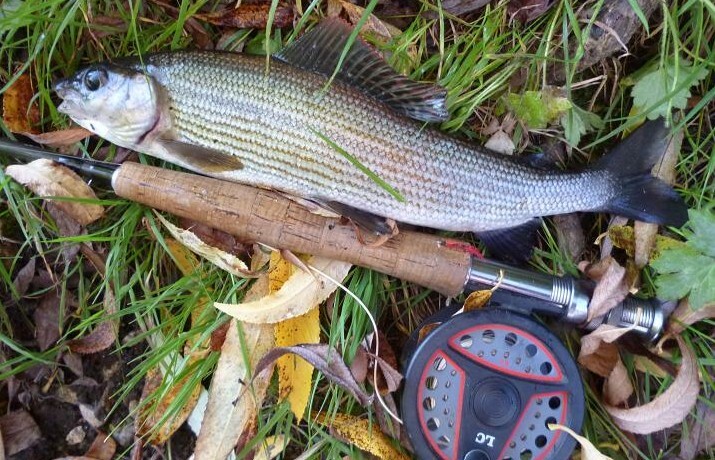 With no net, I’d had to play this grayling to a standstill and took time to hold it’s head upstream in the flow, until the gills were working hard, watching it finally sail across the stream, noting how cold the water was on my hand. 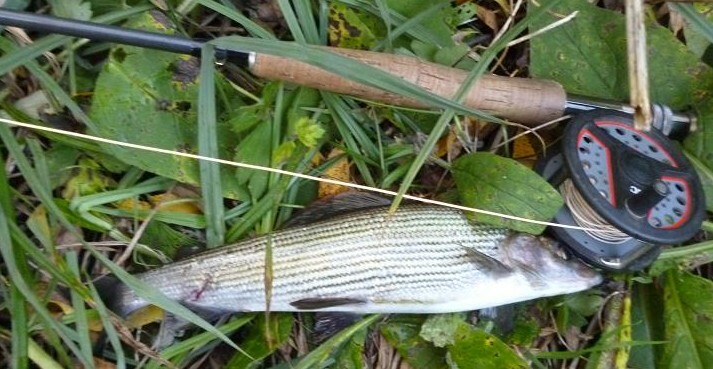 Back in the river, on my first cast, the line sank again at the same spot, lifting in disbelief into another battling grayling, this time slightly smaller and easier to bring to hand, seeing that it had damage to it’s tail, probably from a small jack pike. That pool had given up enough of it’s fish and I continued to wade, finding pockets of smaller grayling, fighting like dace, their takes as rapid. Walking further up, a groin sent the flow close to bushes on the far side and in my effort to get the perfect cast, snagged a willow behind me, too high to reach, having to pull for a break, losing tippet and fly. Mid stream I tied on another length of 4 lb line, then looked in the fly box for a gold head. Staring at me was a home tied red nymph, that had been deadly for grayling on the Avon in the past. Worth a try, I tied it on, making a long cast among the swirling eddies. The leader stopped and I struck, the line arcing round, as another good grayling kicked away upstream, holding the rod high to absorb the strain. More pressure and it turned down and across to be lifted out. I was getting the hang of this. Once again those colours of the rainbow, the Lady of the Stream in her full finery, the red nymph, be it a bloodworm, or a red maggot imitation, selecting a better fish, a layer of copper beneath the wool giving it just enough weight to sink toward the bottom. Whether I hit it right on the day, I don’t know, but caught at least one grayling from every pool I tried, losing count as I worked my way upstream, missing a few of the takes, which I put down to the smaller 6 to 10 inch fish, although I still had plenty of them. This was a red letter day in more ways than one, the weather ideal; warm, without a hint of breeze, the autumn sun giving a golden hue to the sky, the river clear of the leaves, that will fall in the following weeks. Even the kingfisher passed up and down at regular intervals, giving it’s metallic shriek of warning. 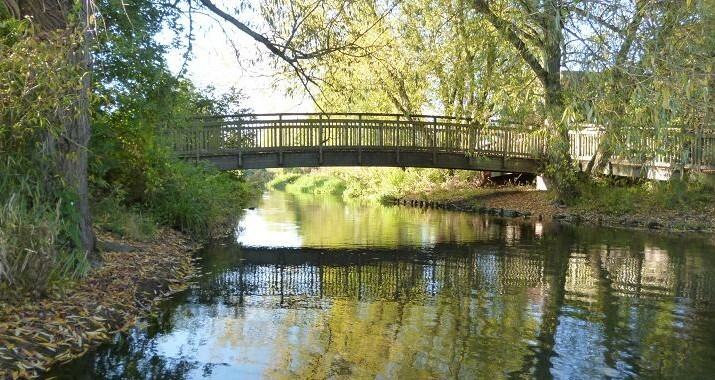 Approaching a footbridge, I fished my last pool of the afternoon, yielding another pound grayling, my sixth of the afternoon, being watched from the bridge by two young uniformed school boys, who came down to see me land the fish. Having returned all my fish, I can only hope that others do also, being a free, open to the public water, which is fished by maggot drowners and lure fishermen, having watched a plug fisher land a pound jack on my way back. Stepping out to the roadside again, it was already rush hour, or should I say slow hour, looking at the rows of stationary cars with over heating engines and drivers. Soon I was among them too. Two days of heavy rain transformed my usually placid local river into a raging torrent at the beginning of the week. 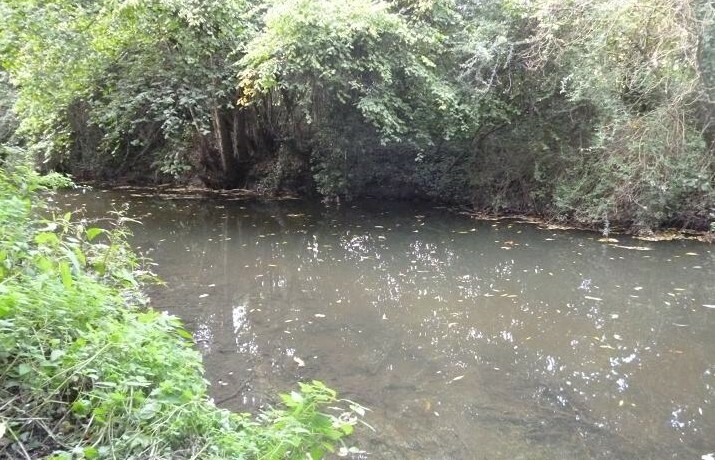 It had been at it’s lowest level for years, a series of near stationary pools joined together by water trickling over gravel, the larger fish creating bow waves, as they tested the boundaries. Then the rain started, drizzle at first, increasing in volume, until it was coming down like stair rods for hour after hour. With maggots to use up, I was keen to get on the river, taking a chance that it would be fishable on the first dry day. Looking over the bridge, the river was now between it’s banks and the brown water was gone, although it was still pushing through, carrying leaves and branches washed out from the wooded banks. My winter swims were full of the sweet smelling scent of Himalayan Balsam, this invasive annual packed together in tight jungles, where the seeds had fallen the previous autumn. I made a bee line for a swim, that had been good to me last year, only to find that a tree had fallen along the bank, it’s branches reaching across the river, preventing any access, forcing me to continue my search. A hundred yards downstream, another tree had fallen, this time creating a swim, coming down to leave a narrow shelf just wide enough for my tackle box, the place where it had stood, now open to the sky, ideal for a float rod. On the inside of a bend, the flow swept beneath a bush and overhanging branches, just the place for chub to hang out. While tackling up my 12 foot Hardy match rod, I sprayed a few pouches of red maggots over toward the bush, setting up with a 3 No 4 Middy Ali Stem stick float. First cast over, the float dipped and sailed away, a typical chub bite. The rod bent over, connecting with a hard charging fish, that flashed bronze beneath the surface, the expected chub revealing it’self as red finned rudd. Another couple of maggots on the size 16 hook and the rig was swung out again, dropping into a small bay above the bush, being carried away with the flow, then sinking from sight. This time it was a chub, not big, but powerful enough to bend the lightweight rod right over in it’s initial rush, causing me to backwind to ease the shock, as it dived for cover. This was the first of eight chub ranging from 8 to 12 oz, a spray of maggots preceding each cast, the float never travelling more than a few feet, before it disappeared. Then I hooked and lost a chub, as it turned away on the surface, the hook flying back to tangle in the nettles at my feet. That was enough to scatter the shoal and I never saw another, despite trotting the float well downstream beneath the trees. Adding a foot to the depth, I dropped the float short, past the middle, holding the float back against the current, seeing two slow dips, before it sank away. This time I guessed the species correctly, as the first roach of the day came to hand. With hemp from the freezer, I began to feed this deeper line, alternating between maggots and hemp each cast, the roach lining up to take the maggots, the occasional rudd, or small perch, also getting in on the act. 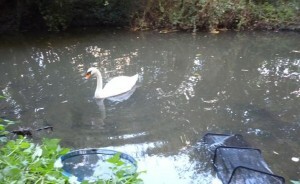 The keepnet was beginning to fill, when a hiss announced the arrival of a swan, speeding along at the sight of free food offerings. Regularly fed by bread wielding mums and young children, these swans do not understand, that they are interrupting a serious sport, this one extending it’s long neck to the bottom, where it began mopping up the feed meant for it’s scaly friends. Catapulting hemp at the swan, which bounced off it’s back, seemed to encourage it all the more. 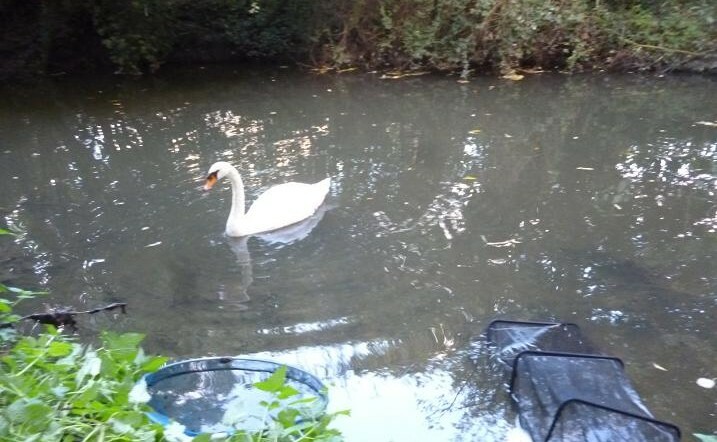 I could not fish for fear of accidentally hooking the winged monster, finally, when it seemed to have exhausted the supply of bait on the bottom, the swan began to look elsewhere in my swim and I began firing bait upstream round the corner. Catching it’s attention, the swan made off in search of these offerings and once out of sight, I began to re-bait the swim. 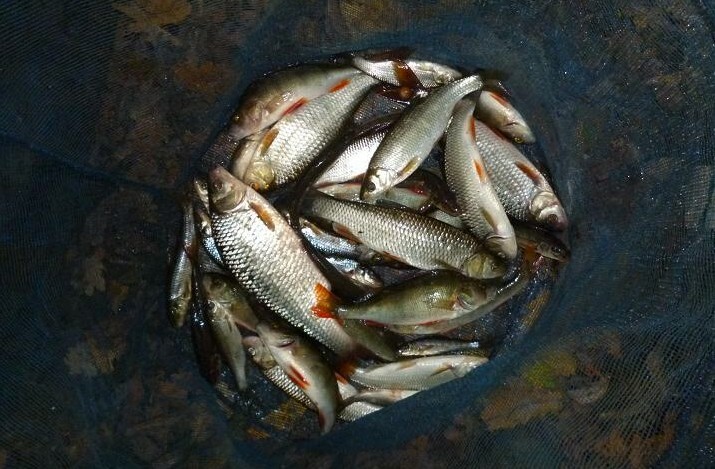 There were only gudgeon left, plus the odd small roach and when the swan returned, I decided to call it a day. With close to 8 lb of fish in under four hours, this small river, which serves as a surface drain for the town, came up trumps again and I was able to arrive home at the time promised, much to the surprise of my wife. 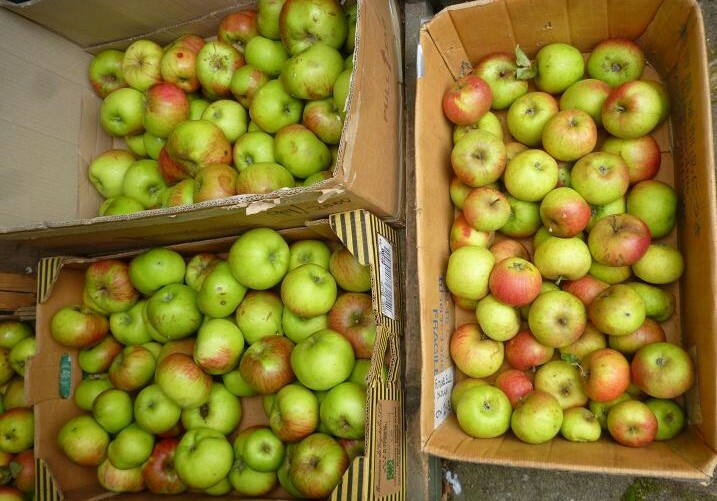 There was an ulterior motive to visit a local garden this week; it is time to make cider and there was a surplus of Bramley cookers and Cox’s sweet apples, just waiting to be picked. Wet weather and a family holiday had meant no visits by me for a month and the lady owner of the cottage garden was becoming anxious, due to the appearance of rabbits on her lawn again. Arriving in the late afternoon, I unpacked the Magtech 7022, a .22 semi automatic rimfire rifle, which when firing subsonic ammunition, is quieter than my air rifle. 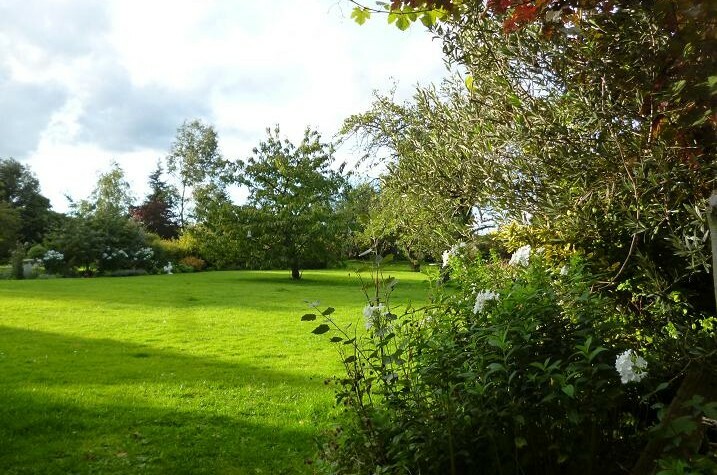 At the entrance to the rear of the garden, I stood to one side and scanned through the scope, searching among the flower beds for movement, spotting the rounded brown shape of a rabbit up between the apple trees at the far end. Too far for a shot to hand, I retreated behind the hedge, getting down onto the ground for a prone shot, using my shooting bag to rest the rifle. At about 50 yards away, the body of the rabbit was hidden behind a slight rise of the lawn, but the head and ears were visible, ducking it’s head to feed. I was confident of a kill at this range, having zeroed in the rifle on a previous shoot. The cross hairs were placed just to the rear of the eye and the trigger gently squeezed. The rabbit disappeared from view. After a five minute wait, nothing else moved and I got up, only to disturb a rabbit feeding just yards from it’s dead comrade, watching it hop into a dense flower bed ten yards away. I stood and waited. The leaves of a shrub moved, when the rabbit decided that it was now safe. I zeroed the scope down to the minimum 3 mag and scanned beneath the shrub, picking out the back end of my quarry and aimed ahead to where the chest, or head would be. Pop! It jumped and dropped. Two in ten minutes. That would do for now. After a quick walk round, it was time to pick some apples, the lady of the house giving me carte blanche and began filling boxes for the next half hour. I kept my eye open for rabbits further down the garden and as dusk was falling, caught a glimpse of movement on the far lawn, creeping round to see one now busy feeding down by the lodge. Backtracking round the garden, using the flower borders for cover, I was able to get down on the right hand side of border in the picture, pushing the gun bag and rifle out from cover, then sliding behind the scope for an easy 30 yard headshot, the rabbit slumping forward on impact. A ten minute wait saw no more intruders and I gathered up my latest prize and continued collecting apples. 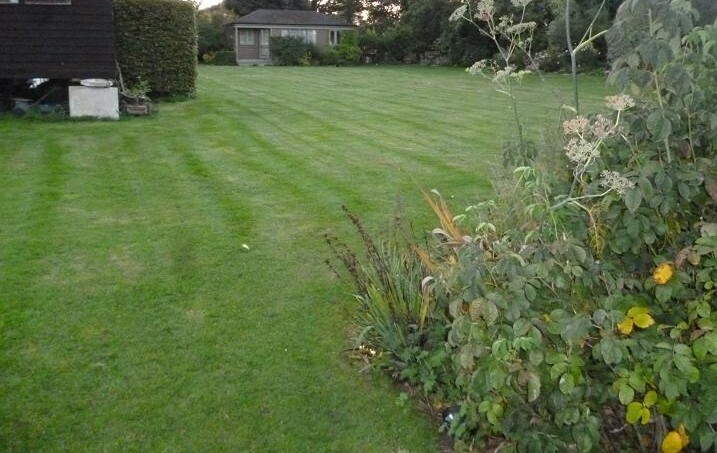 The owner’s son was pleased with the result, although I never seem to be there, when there are rabbits all over the lawn. 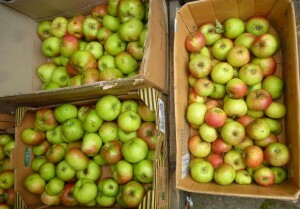 He was also happy that the apples would not go to waste, helping me load them into the van , going off to the greenhouse and coming back with a large bag of grapes, these transformed into 4lb of jam the next day.